Im running Ubuntu 13.10 with Virtual Box running Windows 7. Have a shared hard drive set up between the two. Im thinking now its because im running a partition. (i understood a partition runs exactly like another operating system with everything you need and can do. Any one encountered this problem and how did you overcome it? I have installed windows for 3 reasons. First have to install the extension pack for Ubuntu as @rusty says in the comment below. Then install the VirtualBox extensions pack - open the virtual machine, and install the guest additions pack as explained here. To add devices click the green '+' to the right - you might as well add all that are listed by it. Works for Android (mostly), Windows XP, 7 and 8(.1) :D - Haven't tried my phone, but the camera seems to work, and I can use my memory stick to copy stuff on and off the virtual machine as I can't be bothered to set up a shared thing. This will add the USERNAME you specify to the vboxusers group, so you have permission to access the USB devices from inside a VM. Installing just VirtualBox alone does not give you seamless movement between host OS and guest nor does it allow USB devices to work; without installing Guest Additions. Guest Additions are installed in the Guest OS whereas VirtualBox is/was installed on the host. Read the following and keep in mind: Switching versions of Virtualbox will NOT delete your windows 7 vm or any virtual machine which you have CLOSED, by SAVING. 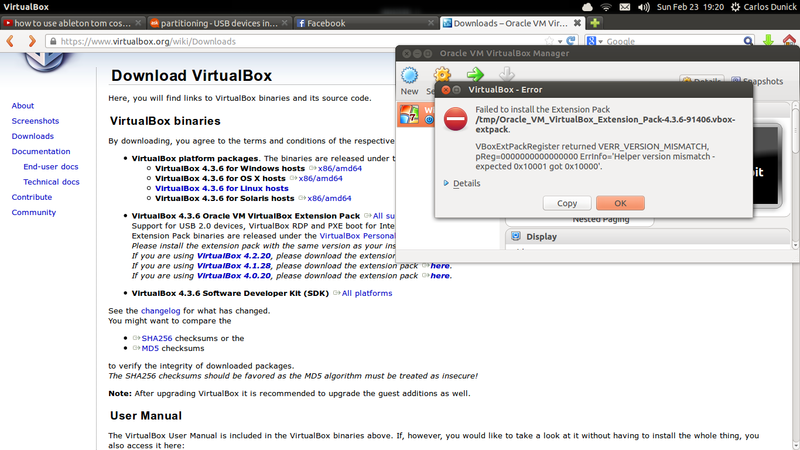 You can easily add your Virtualbox created VM(s) and compatible VM(s) to your new VirtualBox. To be clear...When you update or change the version of Virtualbox, DO NOT EVER delete or format or otherwise permanently remove any in-production virtual machine(s), or currently used virtual hard drive(s) or physical drive(s) when you have important information anywhere on the drive (real or virtual) which you do not want to lose. ALWAYS, Always, always.... Make sure important information is backed up no matter what you are doing with any device. Okay, did you install the VB directly from a package downloaded from the Oracle website, OR more likely the package that is found in the Ubuntu Software Center (USC) on Ubuntu? I assume you have VB downloaded and installed, but you did not know about Guest Additions.iso? Both VB and Guest Additions are Oracle products and completely free of charge. You should (but not required) use the Oracle website official version. NOTE: If you have already gone to the Oracle VB official site and installed the Oracle version from them directly, skip to Section 2 at bottom of this response, and see if the Guest Additions.ISO is already available to you. In the "Devices" menu in the virtual machine's menu bar, VirtualBox has a handy menu item named "Insert Guest Additions CD image", which mounts the Guest Additions ISO file inside your virtual machine. A Windows guest should then automatically start the Guest Additions installer, which installs the Guest Additions into your Windows guest. You will then need to restart the Windows virtual machine. Hi I am using virtualbox 4.2.16-dfsg under Xubuntu 13.10, I installed the vb version from a pacakge, intalled guest aditions on the guest machine and installed exact the same version of the extension pack from the Oracel site. You should see only one package and it should be usable: true, if not you have to work around it first. I enabled the EHCI Controller but i didn't make any filter or something like that. 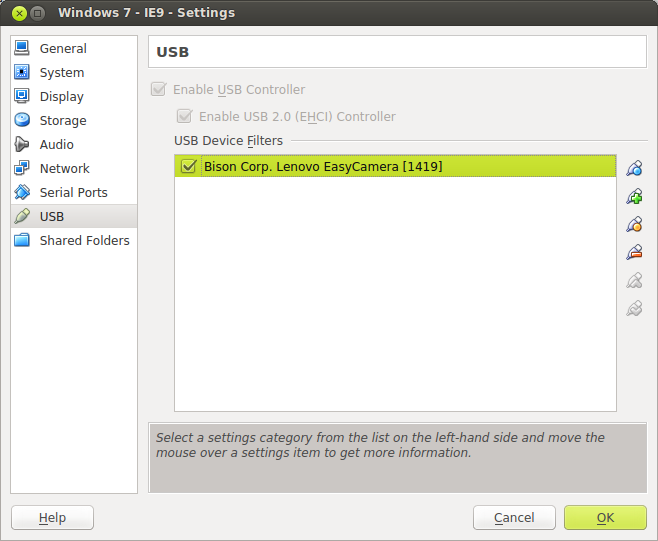 see at the bottom the usb devices list. Not the answer you're looking for? Browse other questions tagged partitioning virtualbox usb-drive itunes or ask your own question. 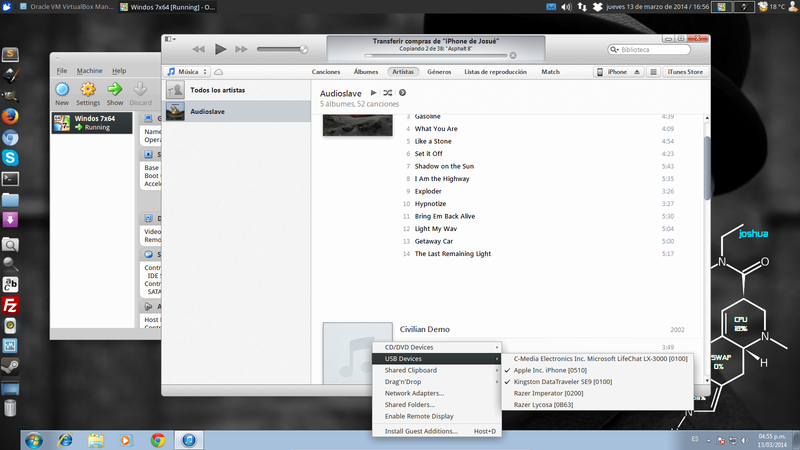 Can't see the floating menu of virtualbox virtual machine!